Cigarettes & Red Vines - The Definitive Paul Thomas Anderson Resource: Diving Deep Into ‘The Master' Trailer; Megan Ellison Says The Film 'Changed Her Life'; Screening At Fantastic Fest? Diving Deep Into ‘The Master' Trailer; Megan Ellison Says The Film 'Changed Her Life'; Screening At Fantastic Fest? Today we have a big round-up of news for you. So if you were busy watching the trailer all weekend as we were, you may have missed a few exciting (if less seismic) developments. First off, in my other life over at The Playlist, I posted a somewhat lengthy trailer breakdown for those who might not be as up on the film as Cigs & Vines readers. I wanted to give a big thank you to our commenters (Tyler, anonymous, etc.) for all their help fleshing out the article. If you havent' read it yet, head on over and take a look and if there's anything else I left out, please let me know kindly in the comments. Financier/patron saint of cinema Megan Ellison tweeted the following heartfelt thank you to Paul but since he doesn't have Twitter, we'll repost it here in hopes that it gets back to him. Paul Thomas Anderson and The Master have changed my life in such a deeply profound way forever that all I can really say is, thank you. In other news, we recently heard whispers that a couple weeks ago Paul was in Austin testing the sound for "The Master" at the Alamo Drafthouse. Our sources say he had a soundboard set up testing levels and at the top of this post there's a picture (via Tumblr) to prove it. 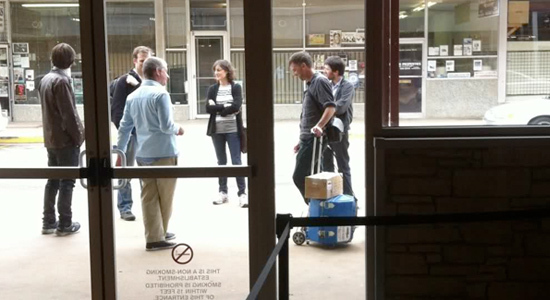 You can see Paul standing alongside his composer Jonny Greenwood, Alamo Drafthouse owner Tim League and a mysterious blue canister that may or may not contain the greatest film of 2012. Rumors are flying of a possible Fantastic Fest premiere as you'll remember "There Will Be Blood" had a secret screening/premiere there back in 2007. Update 7/23: A commenter with the inside track says, "It was more than just sound tests. The finished film was screened for League weeks ago. It is already booked to play Fantastic Fest. Take that to the bank." Fantastic Fest runs September 20-27. In other festival news, TIFF starts announcing their lineup on Tuesday and Venice has announced its opening night film with the rest of the lineup being announced in the coming weeks. We already know Venice is gunning for the film so we'll see if their efforts are successful. And finally, The Daily Beast posted a semi-spoiler-ish article where a Scientologist read through the old leaked draft of the screenplay and compared notes between Scientology and The Cause. Short version: lots of similarities. FYI, we're a lot more active on Twitter than Facebook so if you like your news up-to-the-moment, that's where you want to be. GREAT STUFF as usual... Loved the article you did. Also loved the article The Daily Beast made, though it's FULL OF SPOILERS : /. I already read the script so I don't mind.. But some other people will. As far as that being Paul in the elevator, man.. I find it hard to believe too, but the resemblance is uncanny. Guess we'll just have to see the movie to confirm it. P.s: Thanks for mentioning me.. I will try to keep contributing to you guys and this site in every way possible ; ). It was more than just sound tests. The finished film was screened for League weeks ago. It is already booked to play Fantastic Fest. Take that to the bank. Anyone knows why the inscription says 'Homo Sapiens' with a capital S instead of the proper scientific nomenclature 'Homo sapiens' ? I could be wrong, but the guy standing to the right of PTA looks like Colin Greenwood, Jonny's brother and Radiohead bassist. Can we ease up on the hyperbole just a bit in these write ups? @MODAGE: YOU DON'T KNOW ANYTHING MAN, LEAVE YOUR STUPID COMMENTS IN YOUR POCKET. THAT IS HIM IN THAT ELEVATOR. THIS ISN'T HITCHCOCK MAKING A CAMEO, BRO. MOST PEOPLE THAT GO AND SEE THIS FILM WILL NOT KNOW WHAT THE FABULOUS PAUL THOMAS ANDERSON LOOKS LIKE. SO HE PUT HIMSELF IN THE ELEVATOR & ON A LITTLE OF HIS OWN FILMS CELLULOID...SO WHAT? IT'S NOT DISTRACTING, IT'S FOR THE CINEMA LOVERS, MAN, THE FANS, STUPID. P.S. SORRY FOR THE CAPS, MY LAPTOP ISN'T IN TIP TOP CONDITION. @SHAUN USHER: YOU ARE WRONG! WHY THAT IS HENRY PLAINVIEW FROM THERE WILL BE BLOOD! INVALIDATED. I HOPE THAT WAS TONGUE IN CHEEK. Way to steal an insult from The Room and try to use it seriously. As far as I'm concerned, you can drop off the Earth. That's a promise. My over-the-top reply above was in (failed) effort to echo what TK-421 said about going easy on the hyperbole in these articles. I don't want the author's opinion about what is and isn't distracting to he or she. This isn't a personal blog. I just want the facts. @anonymous...of course I wasn't trying to use it seriously, come on! I am sorry for not attributing rightful credit, to my hero, Tommy Wiseau. @jack edmondson...I got nothing to say to you. That's a promise. i´m from Perú so i will have to wait till february 2013! Sorry, everybody. Had to do a little maintenance on the comments. Removed some derogatory remarks. Carry on. Great work as usual, Dears/Deers. Thank you for keeping us updated. could they have just censored it, charlie, could they have... "I don't want the author's opinion about what is and isn't distracting to he or she. This isn't a personal blog. I just want the facts." go color in your own site, charlie. must you always ruin such things? ALWAYS?? oh and as one day you will discover AAAAAS UUUUUSUAL..it isn't him in the elevator, you lump of afterbirth, slithered out your mother's filth. ...it is 99.9% PTA in the elevator, "Mom." I've had a feeling from the moment the project was announced that 'The Master' will change my life. Don't doubt that it will. Fellow Anderson followers feel free to hop over to my blog (below) for reviews and some Anderson related articles.